Some of Santa’s favorite stores have scheduled holiday events this Christmas season. Jingle and/or Jangle will be making guest appearances. They will be so excited to see an Elf Magic friend. Find a store near you and start celebrating with Elf Magic! MattyB stopped by the North Pole and ‘kicked back’ with Santa and the Elves. Watch, Dance and Sing Along!!! Santa and Mrs. Claus are saving the best surprise for last. They always support us in all of our work and play here at the North Pole and around the world. So, when they heard the news their smiles beamed from ear to ear. The Elf Magic Elves have been selected as one of the hottest friends for kids this holiday season! Be sure and check out ALL of the new Hottest Top Toys that we have been so busy making here at the North Pole in the latest edition of Women's Day Magazine! Also, Our Forever Elf Fashion Elfits were chosen as a top toy, by The Toy Insider! This is a shout out to all of the Elfit Designers at the North Pole for a job well done! 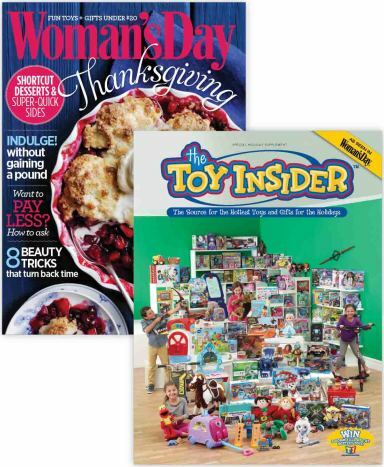 Thank you, Woman's Day and The Toy Inside for the great awards!